The team assembled at the field house on Monday evening for a rather unusual mid-week weekend Wash trip. We were all confused by the days, constantly referring to Friday, Saturday and Sunday rather than Monday, Tuesday and Wednesday. The main aim of the weekend was to make a Sanderling catch with a second catch of Bar-tailed Godwit and Curlew if possible. Rob P had undertaken a recce on Sunday morning and had located 150 Sanderling and 200+ Oystercatcher at high tide on Snettisham beach. Dave K had undertaken a further recce on Monday morning and had found 500 Sanderling on Snettisham beach. Dave had also looked at the fields behind Snettisham pits, where we had made a good catch of Bar-tailed Godwit and Curlew last summer. A small number of Curlew and 2 Black-tailed Godwit were the only birds present. No birds were found on Ken Hill. Emily, having just gained her well-deserved cannon net endorsement, was chosen to lead the trip and gave the initial briefing to the assembled team. The high tide and strong wind made an initial evening catch impossible and the decision was made to use the evening to undertake further recces of possible catching areas so that we could maximise the chances of a catch on the following morning. Emily organised teams to recce several sites including Snettisham beach, Terrington, Heacham North North beach, Holbeach (for Greenshank) and the fields behind Snettisham beach. The team gathered back at the base at 21.00, extremely wet and windblown, to discuss the findings from the recces. It was agreed that the conditions had been quite challenging (to say the least) this evening with high winds and rain. Snettisham pits – large numbers of waders piled into the pits with few birds going into the fields behind. Snettisham beach – good numbers of Sanderling scattered across the beach. This could be a possibility for a catch. Holbeach – twenty Greenshank present on the side of the pool. However, the logistics of catching here were thought to be too difficult. Terrington marsh – the pools were flooded at high tide but no small waders flying around. A few Curlew were seen on the Ongar Hill side of the pool. Heacham North North beach – approximately 50 Sanderling and 10 Turnstone above the tide line at high tide. Also 2 adult Ringed Plover with 2 young. Weather predictions for the following morning were again for high winds which would be likely to result in a high tide, making any catching attempt unsuitable both for the birds and the team. The team were therefore treated to a lie-in the following morning, taking the opportunity for further recces to maximise the chances of a good catch on Tuesday evening and Wednesday morning. The teams were up at 06.30 and on their way to their respective sites by 07.00, reconvening at 11.30 for breakfast. Sam and David took the late shift and headed to Snettisham to look for colour ringed birds. Given that Sam was 40+ weeks pregnant at this time, this seemed to be a reasonable choice! Boatmere Creek (can be a good site for juvenile godwit) – 43 Greenshank but no Black-tailed Godwit. Also fantastic views of a beautiful Turtle Dove and a juvenile Cuckoo. In terms of colour-ring resightings, Sam and David located a Redshank ringed at Welwick Saltmarsh on the north bank of the Humber on 29th October 2016 and a Knot ringed in Norway on 24th May 2016. 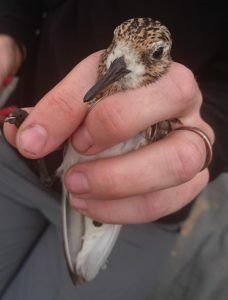 Unfortunately Sam and David could only get part of the colour-ring combination on the Knot but this at least enabled the ringer to link the bird to a specific catch. The ringer is keen for us to look out for his yellow-engraved flags on Knot as they move south. Following these successful recces, a plan was made for a catch on the evening tide at Snettisham beach with a second catch on Wednesday morning on Heacham South beach. A briefing included the usual demonstration of lifting a net using the WWRG tea towel alongside the new WWRG video. Food was organised as tea was to be eaten on the beach between setting the nets and taking the catch. Nigel also explained the complexities of catching migrant populations of waders as opposed to the winter populations that we usually catch. A further complication was the Ringed Plover nest – this had already been relocated on the previous evening by a local birder with an interest in the local Sanderling population, to avoid it being swamped by the high tide. The nets were therefore to be located at least 100 m south of the nest in order to prevent any further disturbance. The trailer was packed and a couple of hour’s downtime enjoyed before leaving for Snettisham at 16.30. An effective net set was completed at 18.15, only 15 minutes behind schedule. Unfortunately tea was a rather hurried affair which definitely did not do justice to the amazing spread provided by the catering team. In complete contrast to the previous evening, the atmosphere was absolutely stunning, sunny and calm with wonderful views across the Wash. Birds were all moving south as we enjoyed our tea but had completely disappeared by the time we got ourselves into position at 18.45. By 19.45, the tide was reaching the furthest reach of the net so coming up further than expected. There were only a small number of birds on the beach at this stage and the firing team promptly made a quick dash to shorten the jump ropes. Cathy, meanwhile, walked to Heacham South beach to recce possibilities for the following morning’s catch. Birds then began to arrive onto the beach with 100–150 Sanderling between the two nets with the tide rapidly advancing. The decoys brought the birds into the area and a careful amount of twinkling moved the birds into position, resulting in a successful catch of 55 birds, five of which were retraps. The birds were all ringed and processed efficiently without the need to start the generator. Sanderling was a new bird for a few of the team to ring. It was agreed that 55 birds represented a good catch and that a further catching attempt would be made on the next tide. One of the retraps was a Norwegian bird for which we look forward to finding more details of its ringing history. By 23.00, the team had returned to the field house and unpacked the trailer. Having got up at 05.00, two nets were set by 07.00 on Heacham South beach. There were no grey waders initially on the beach but gradually a nucleus of birds built up with a flock of Oystercatchers towards the north end of the beach. A second nucleus then began to form near the nets. Both groups were fairly mobile. There was also a problem with a small group of Ringed Plover which were moving in and out of the safety area. Some clever twinkling was orchestrated by Emily and Nigel which moved more birds towards the nets and a good-sized catch was taken. The Ringed Plover were extracted and ringed straight away since these could have been breeding birds with eggs or young on the beach. The ringing and processing was moving along nicely until the predicted rain began towards mid-morning. A tarpaulin was hurriedly erected between the cars to enable the team to keep ahead of the rain. Unfortunately, the tarpaulin collected a lot of water over the morning, resulting in water pouring down Dave’s back as someone tried to lift the water out! A good number of local passers-by stopped to talk to us which is always enjoyable and helps us to share the aims of the group. Every bird was successfully ringed and processed within the four hour time limit of a catch and several new members of the team ringed these species for the first time. It was agreed that this was an excellent catch and had fulfilled the main aim of the weekend. It was definitely a case of saving the best to last! Once the birds had all been returned to the beach, the equipment was packed away and the team returned to the OSH for a well-deserved breakfast. The equipment was cleaned, checked and packed away, ringing data was checked, rooms were cleaned and tidied and it was time to leave. Quote of the trip was provided by Rob R when someone apologised to him for being in his way at 05.15 on Wednesday morning. Rob replied ‘I don’t know my way so you can’t possibly be in it’. Thanks to everyone for making this another very successful trip, in particular to Emily for being our team leader and to the fantastic catering team of Lizzie, Gerry and Emma.